A man more popular than at the time he seemed to be. He is, paradoxically, known to those who have never heard his name spoken. Many have read him and have been unconsciously influenced by his words and images. Jędrzej Kitowicz is embedded imperceptibly in Polish history and has helped to form the popular way of understanding of the traditional Polish culture. If he had not written his two significant books "Description of Morals" and "Memoirs of Polish History" all susequent publications dealing with traditional Polish culture would have looked utterly different.Thanks to him we know a lot of details and anecdotes subsequently paraphrased by other novelists and historians. Details and anecdotes which make their work far less dry. This produces both pros and cons. Jędrzej Kitowicz, an excellent observer by nature, created an image of Saxon times which was colourful, funny but also scary at times in the way that it exposed moral ambiguities and abnormalities. All of this collectively influenced our negative attitude towards the Polish culture at the end of the Republic of Nobles. Thanks to Jędrzej Kitowicz we can observe this culture through a keyhole. So where was Jędrzej Kitowicz from? Was he bourgeois or noble? Until recently it has been a subject of discussion between literary historians and biographers. It has been possible to discover his vital records and to determine his origins and when exactly he was born. Jędrzej Kitowicz was born in Warsaw on November 25th 1728. His parents were famous, Andrzej Kitowicz and Katarzyna Buczkowska. Probably he was educated by the Jesuits at Poznań or in Kalisz. 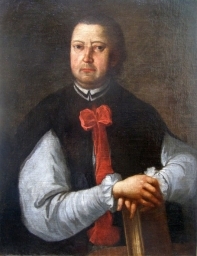 Later he became secretary to the abbot of the Benedictine monastery at Lubiń.This job had to forge its passion for trading in memory and on paper everything he considered important.When he was 40 war broke out with Russia - the so-called "Faith and Freedom War" the conflict involving the Confederation of the Bar which Jędrzej Kitowicz joined. This did not stop him from writing.He was promoted to captain and in March 1769 the commandership of Poznań was entrusted to him for a short period of time. Afterwards he became the secretary of Józef Zaremba who at that time was chief of the Great Poland Confederation. The correspondence maintained by him at this time can be seen preserved in the Library of Kórnik near Poznań.However, even before the fall of the Confederation Jędrzej Kitowicz decided to leave the army in order to enter the seminary and become a priest. Later, as an elderly priest in Rzeczyca on the river Pilica, Jędrzej Kitowicz committed his two works to paper - partly from memory and partly from notes made by him throughout his life. He died on April 3rd 1804.